AAA State of Play Blog: What to Consider while Buying Playground Swing Set? What to Consider while Buying Playground Swing Set? Playing is a crucial and important part in the growth and development of your child. It helps your kids to grow physically, emotionally, cognitively as well as socially. Play allows your child to learn how to make choices, solve problems with their friends, it helps them learn how to communicate, share and socialize as social beings. Evidently, play is a basic need for your child. 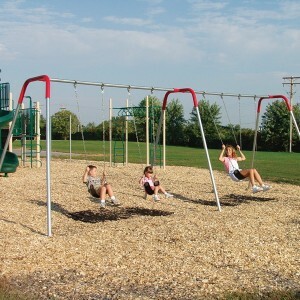 Swing set is one of the popular playground equipment among kids of different age groups. Unlike when buying other play items, you need make careful considerations when buying a playground swing set to ensure that you not only obtain value for your money, but to ensure the safety of the child as well. So what should you take into account when buying a playground swing set? The size of the playground area or play space you are going to erect the swing set will determine the type and size of swing set you buy. You do not want to buy a swing set that will occupy the entire space in your backyard thus restricting your ability to carry out other activities or limit the number of games the children can play. There are hundreds of different types of swing sets available that come in varied shapes and styles and sometimes it can be overwhelming for you to select the right one. The most common types of swing sets are wooden swing sets, metallic swing sets and tire swing sets among others. It is important that you buy the type of playground swing set that suits the age of the child and meets the playing needs, preferences and expectations of your child. However, it is important to remember that what might be appealing to you as an adult may not be for the child and on the other hand, what might appeal to the child may not be appropriate or safe for them based on their age. Therefore, take your time in choosing the type of swing set you buy. Cost is an important factor when buying a playground swing set. Different types, designs and sizes of swing set cost differently. If you are working on an open budget, you may want to consider buying playground swing sets with trendy accessories or buying swing sets made by reputable brands. Nevertheless, there are relatively cheap playground swing set that are quality, safe and durable. The next time you plan on buying a new swing set, ensure that you take these three factors into consideration. Buying the right swing set is the best gift you can give a child you love and care about!